Honk your horns - toot! toot! It's the traintastic world of Chuggington where eager engines Wilson, Koko and Brewster are learning to become working trains. The three trainees are thrilled to spend a day with Action Chugger, who makes flying look easy - but Wilson discovers it isn't so simple after all! Dunbar's exciting new training device causes a storm and can Brewster overcome his fear to win his rescue badge? 6 Episodes: Jet Pack .. It's time for the three trainees to move up to advanced training. Wilson joins the Chug Patrol rescue squad, Brewster teams up with the Chuggineer construction crew and Speed Fleet recruits super-fast Koko. When Koko finds herself in peril, can Wilson prove that he is a brave new hero of the rails in the Chug Patrol - Ready to Rescue Special. Feature length Special: Chug Patrol: Ready To The Rescue, Episodes: Chief Wilson, Park Patrolle..
Trainee engines Brewster, Koko and Wilson just love pretending to be Action Chugger, Chuggington's very own jet-propelled film star. So any chance to meet their real life super-hero is just the ticket! In these fantastic adventures they get to do just that as Koko and Brewster put their stunt skills to use and Action Chugger crashes on the way to the film set. The superhero takes Hodge into space and learns to be an 'ordinary' Chugger, ..
Traintastic Adventures await! 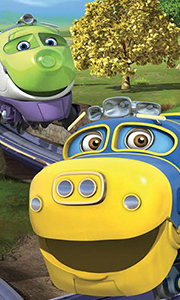 In these fun-packed episodes ride the rails with trainee engines Brewster, Koko, Wilson, Hoot and Toot and the rest of the Chuggington crew. Along the way they learn some valuable lessons and new skills, empowering them to become the best trainees they can be. As Koko does all she can to try to be Chugger of the Year, Wilson learns the value of teamwork, Brewster's turntable lessons prove useful and Hoot di..
Own Chuggington - Chuggineers - Ready To Rescue DVD from Deff, DVD, Blu-Ray & 4K Video Specialists - Free UK Delivery..
Honk your horns – toot! toot! It’s the traintastic world of Chuggington where the eager engines Wilson, Koko and Brewster are learning to becoming working trains. For the three young chuggers there’s always adventure, fun and excitement on the rails as they get into scrapes in a deserted town and the safari park, help each other out of trouble and discover the repair shed is not such a scary place after all. 6 Episodes: Braking Brewster..
Running on time, passengers to take, hauling loads, and pick ups to make! As trainees Wilson, Koko and Brewster are learning, it's a busy life for a chugger - but there's still always time for some adventures and lots of fun. Choo! Choo! In these six traintastic episodes, Harrison's snoring keeps the engines awake; the chuggers play a game of hide and seek and Koko finds a lost puppy. Meanwhile, the trainees try to save Puffer Pete from..
Honk your horns - toot! toot! It's the traintastic world of Chuggington where eager engines Wilson, Koko and Brewster are learning to become working trains. There's loads more fun on the rails as the trainees compete in the Chugger Championship Race; Wilson has cool adventures with Frostini, the ice cream chugger; Koko tries to give a smooth ride to the examiner in her passenger test; Brewster gets a distracting hobby and they all have ..
Own Chuggington - Traintastic Crew DVD from Deff, DVD, Blu-Ray & 4K Video Specialists - Free UK Delivery..
Honk your horns - toot! toot! It's the traintastic world of Chuggington where eager engines Wilson, Koko and Brewster are learning to become working trains. The Great Frostini helps the trainees try for their ice-cream car badges, Zephie is reminded that alarms are for emergencies only and that small engines are useful too! Plus, Wilson plays nurse to a sick Dunbar and discovers his artistic side, and Koko learns the importance of liste..
Own Chuggington - Chug A Sonic - Die Cast DVD from Deff, DVD, Blu-Ray & 4K Video Specialists - Free UK Delivery..
Chuggington - Chugger Of The Year - Limited Edition Die CastChuggington - Chugger Of The Year - Limited Edition Die CastChuggington - Chugger Of The Year - Limited Edition Die Cast..
Chuggington - Icy Escapades - Limited Edition + Diecast ToyChuggington - Icy Escapades - Limited Edition + Diecast ToyChuggington - Icy Escapades - Limited Edition + Diecast Toy..
Honk your horns – toot! toot! It’s the traintastic world of Chuggington where eager engines Wilson, Koko and Brewster are learning to become working trains. Harrison must return to the training yard if he wants to pull the royal carriage; Wilson will do anything to avoid the automatic Chugwash; Koko can’t resist exploring; the Chuggers find going backwards isn’t as easy as it looks and driving smoothly isn’t for dummies – and could that.. Attention Chuggers! Brewster, Wilson and Koko are back with a bumper collection of traintastic adventures! Ride the rails with the trainee engines as they learn some valuable life lessons and new skills, empowering them to become the best trainees they can be! Honking Horns! This DVD includes 18 episodes: The Brewster Booster Koko's New Look Quizmaster Hodge Wilson And The Dinosaur Scrub-A-Chug Next Stop – Space Rolling Reporter W..
Over 50 episodes of fun on the rails - Chugga Chugga Choo Choo! Honk your horns - toot! toot! It's the traintastic world of Chuggington where the eager Wilson, daring Koko and loyal Brewster are making tracks to becoming working engines. For the three young trainees there's always adventure, fun and excitement to be had. Encouraged and looked after by the other engines - such as shunters Dunbar and Calley, joker Emery, ice-cream chugger..